She's a fine actress. She was the most popular afternoon talk show host of all time. Her endorsement instantly transformed any new book into a No. 1 best-seller. The professionals she mentors become superstars. She publishes a top-ranked magazine. She's made billions through related businesses, and now she's gone to the next level: she has created her own cable channel, the Oprah Winfrey Network (OWN). And yet, in spite of everything she's accomplished, like Henry Ford a century ago, she flies under the radar in the wisdom department. I share more than 100 quotes every day on Twitter. And the feedback is always positive. My followers retweet them at almost that rate, and many people comment about how much they appreciate them. I'm certain it's because the quotes are well-stated and ring true. When it comes to quotes, I'm hard to please. 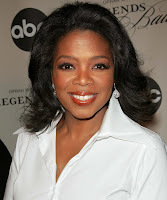 I recently searched for quotes among actors, singers and other performers, and I was surprised to discover that I had collected more quotes from Oprah Winfrey than any other entertainer. I was never one of the loyal fans of her afternoon show whose loyalty helped build her business empire. At four o'clock in the afternoon, I was always preoccupied building my own enterprise. AWARENESS - "Breathe. Let go. And remind yourself that this very moment is the only one you know you have for sure." EXCELLENCE - "Doing the best at this moment puts you in the best place for the next moment." GENEROSITY - "I don't think you ever stop giving. I really don't. I think it's an on-going process. And it's not just about being able to write a check. It's being able to touch somebody's life." GRATITUDE - "Be thankful for what you have; you'll end up having more. If you concentrate on what you don't have, you will never, ever have enough." INITIATIVE - "Don't complain about what you don't have. Use what you've got." PASSION - "Passion is energy. Feel the power that comes from focusing on what excites you." SELF-DISCIPLINE - "I've learned that you can't have everything and do everything at the same time." TOLERANCE - "What I know for sure is that behind every catastrophe, there are great lessons to be learned. Among the many that we as a country need to get is that as long as we play the "us and them" game, we don't evolve as people, as a nation, as a planet." The lady knows what she's talking about. I love the tolerance quote.